Behind every happy, healthy captive elephant is a dedicated mahout. The daily devotion and attentive care they provide is essential. The mahout’s ancient knowledge includes insights into elephant care, healing herbs, and forest conservation. This wisdom must be preserved and cherished if we are to better the lives of Asia’s captive elephants. Elemotion Foundation would like to present a few of these hero mahouts. Fun Fact: Lung Lord trains and cares for Lychee with gentle touch and song. Lung Lord is recommended by John Roberts, Director of Elephants, Anantara Golden Triangle Elephant Camp: The trust between Lychee and the old man is unmistakable. Born in a small village in north east Thailand, Khun Lord, Anantara Golden Triangle’s Resort & Spa Elephant Camp’s most experienced mahout, comes from a long line of mahouts and the skills that he has learnt has been passed on from generation to generation. “It pains me to see how some people treat these beautiful creatures. I have a good, kind heart and I want my elephant to have a good, kind heart too, so when I got my first elephant 35 years ago I trained her in the most unconventional manner by singing and tickling. “I would first find a song with a command in the words and sing and tickle her on different parts of her body, most of the other mahouts thought I was crazy singing to an elephant but that soon passed when they saw the results. Khun Lord starts singing sweetly as he tickles Lychee’s trunk and she automatically lies down beside him and closes her eyes, “This song is a sweet lullaby, the lyrics mention to lay down your head and go to sleep. See how smart she is, she has a great memory. Don’t tell the other elephants but I also think she’s by far the cutest elephant here at the camp,” he gently smiles at his one ton beauty as he softly starts singing to her again. 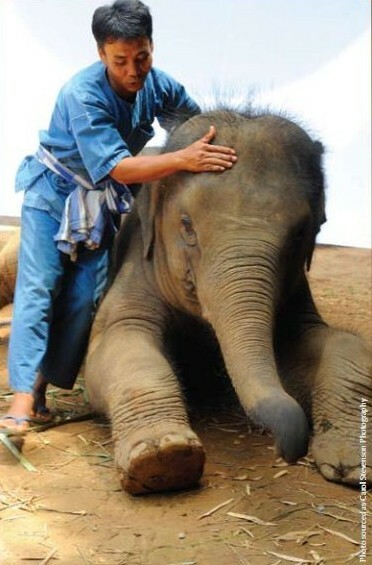 When asked what is the favorite part of his job, Khun Lord gestures towards the slumbering giant, “This is my favorite part of my job, the special bond that you have between elephant and man, I feel so proud of the mutual respect, it’s a bond that is rare and a bond only between a mahout and elephant,” he pauses for a few seconds then pipes up, “Oh and I love to sing, you may have heard of a horse whisper before but I bet you’ve never heard of an elephant singer,” and with that he breaks into another melodic tune. Excerpt from an Elemotion interview with Doh conducted in October 2010. EMF: Does it surprise you that foreigners come here just to sit and watch the elephants? A.- No, because I like to sit and watch the elephants too. It’s really good that people come here to understand the elephant. When you go to shows, you don’t get to see the real elephant, so you can’t understand. If you come here and watch them eating and playing and being with its family, only then, you can start to understand them. Doh is 25 and has worked with BLES since he was 19. He comes from the local village, Baan Tuek. Doh became a father for the first time in September 2010. “Doh, who comes from the local village of Baan Tuek, was working here as a construction worker when we rescued Lom, who was only two at the time. Doh went out of his way to befriend the broken and terrified baby elephant, and she responded very positively to him. After watching them together for a month or so, I offered Doh a permanent position at BLES as her full time care giver. He was thrilled. Doh is very calm with Lom. He understands that she is a child and wants to play, explore and discover. They have an obvious admiration for each other and are more like a brother and sister. Doh always tells people that he loves Lom because she has been through so much pain, but she has grown into a loving and trusting elephant. He is proud of her and wants BLES to be able to help many more young elephants like her. Doh has been recommended by Boon Lott Elephant Sanctuary founder, Katherine Connor.